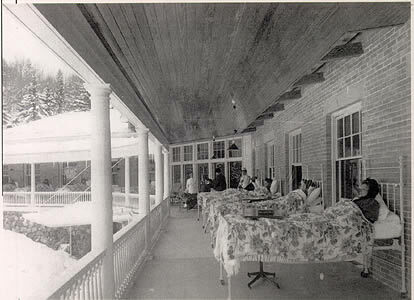 The first American sanatorium was built by Edward Livingstone Trudeau at Saranac Lake in the Adirondacks in 1885. Trudeau, like many of the early pioneers of the Sanatorium movement, was afflicted with tuberculosis, but believed he had cured himself of his symptoms after an extended stay in the mountains in the 1870s. 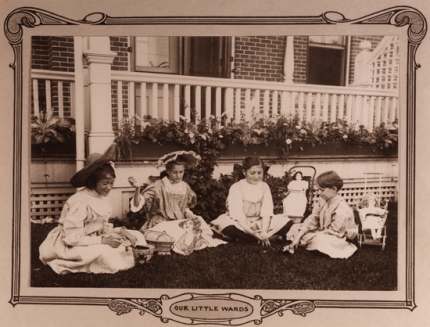 At his sanatorium, he prescribed the same regime of healthy eating and outdoor living that had resulted in his own recovery, requiring residents to spend daylight hours outside riding horseback, walking, or reclining on the broad porches that encircled each of the sanatorium’s “cure cottages.” Trudeau also required his patients to eat several large meals a day, including at least three glasses of milk, and maintained a strict code of personal behavior that prohibited drinking, smoking, and cursing, and enforced a dress code. By 1900, Trudeau had raised enough money to build over twenty cottages at Saranac Lake, an infirmary, library, and chapel, as well as his own Saranac Laboratory for the Study of Tuberculosis. Unfortunately, Trudeau’s “cures” did not stop the spread to the disease in his own body and, although for years he offered himself as a model of recovery, he died from tuberculosis in 1916. The Saranac Lake Sanatorium piqued the interest of Jacob Schiff, the director of the United Hebrew Charities (UHC) in New York City. The organizations affiliated with the UHC struggled to address the needs of thousands of Jewish immigrants who lived in overcrowded tenements and suffered in high numbers from tuberculosis. 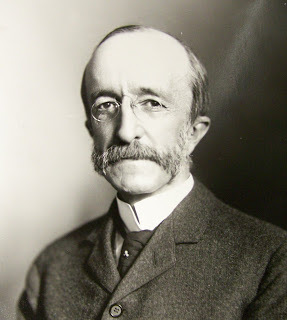 Schiff was impressed by what he saw at Saranac Lake and personally engineered the construction of two sanatoriums specifically for Jewish tuberculars. The UHC raised funds to build two branches of their National Jewish Hospital, one in New York, and a second, large sanatorium in Denver, Colorado. Those seeking treatment at the hospitals had to comply with strict requirements for admission, including multiple meetings with the admissions’ committee, with social workers, and with physicians. 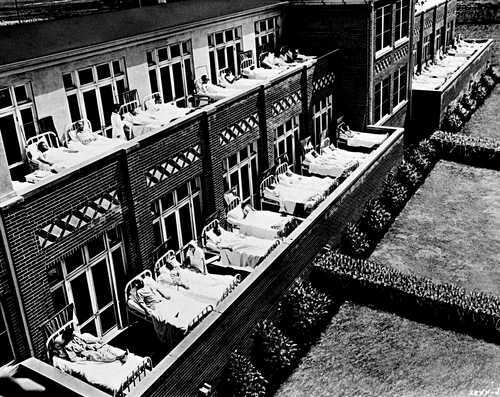 Sanatoriums did not, however, provide a comprehensive solution to the tuberculosis problem. Not everyone was admitted, either because they were deemed too sick to benefit from the curative regime or because they could not afford to pay for extended visits. Many tuberculars gave state officials false information to avoid being sent to a sanatorium because they did not want to be separated from their families, particularly those who were responsible for supporting children or relatives. 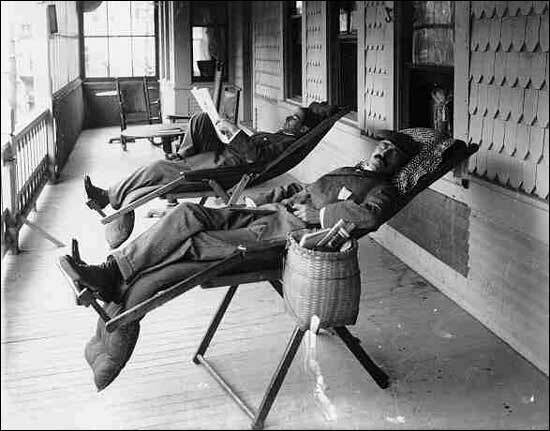 Even as the Sanatorium movement grew, most of the afflicted continued to pursue their own, individual remedies for their illness, perhaps the most popular of which was moving west. Discussion of "The Sanatorium Movement in America"
Version 10 id 24998 of this page, updated 14 March 2014 by Karen Wilson. Created by Caroline Luce.